As I wrote recently, a traditional afternoon tea in one of London’s top hotels can be a costly, if memorable way to spend an afternoon. But it doesn’t have to be and there are many venues that offer the best budget afternoon teas in London that are great value for money. So here is my list, in order of cost, of some of the best value afternoon teas London has to offer ranging from £9 to £33 per person. Be warned, some require you to pre-book and some may charge a cancellation fee if you don’t give notice. 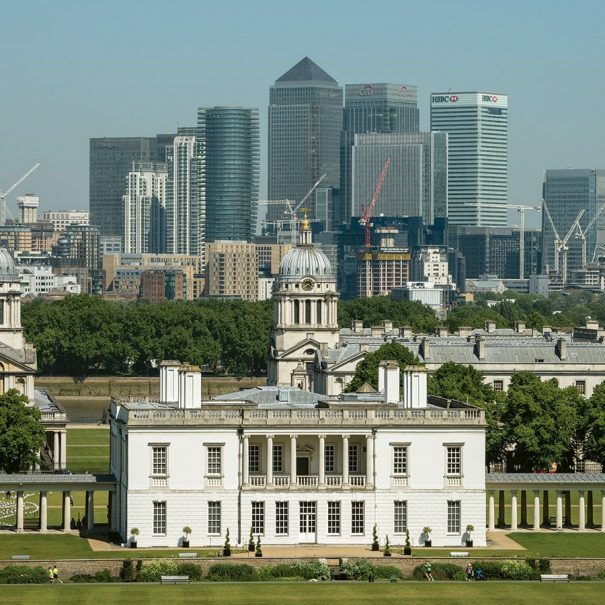 Voted the Best Value Afternoon Tea by the Daily Telegraph, the Orangery at the Fan Museum in Greenwich offers a delicious afternoon tea for only £9 per person. Overlooking a secret garden in the Japanese style, the Orangery is decorated with beautiful detailed murals and has a light airy atmosphere. Your tea comes with a pot of tea or cafetiere of coffee, a slice of Victoria sponge, a choice of lemon drizzle cake or salted caramel brownie and a scone with clotted cream & jam. 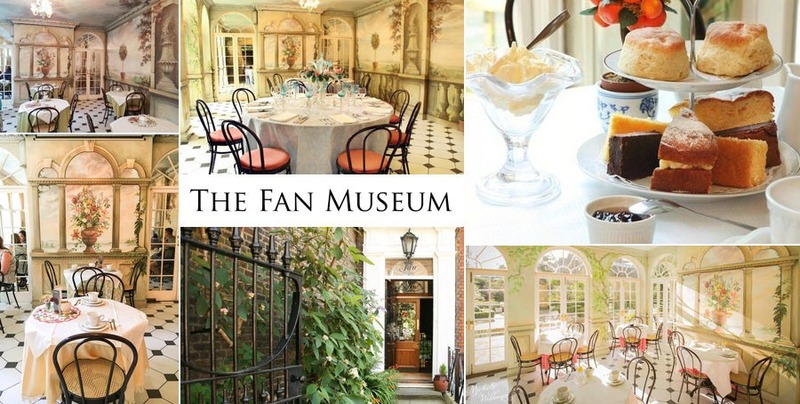 Access to the Orangery is via the Fan Museum so an additional entrance fee of £5 is required. Opened in 1991 the museum was the first of its kind in the world and owns over 4,000 fans dating from the 10th century. There is a permanent display on the history and manufacture of fans and the temporary exhibits are rotated every three months. Afternoon tea is available on Tuesdays, Fridays and at the weekend between 12.30 and 4.30pm. No booking is required. 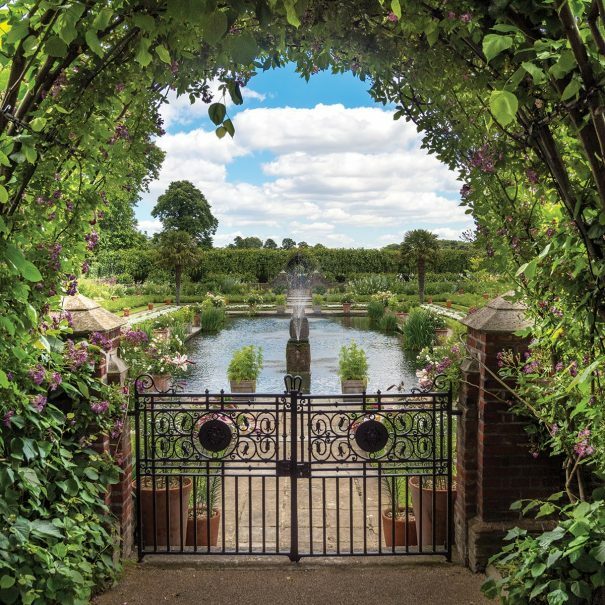 Sometimes the Orangery is closed for private functions so it’s worth checking ahead here. Cost? 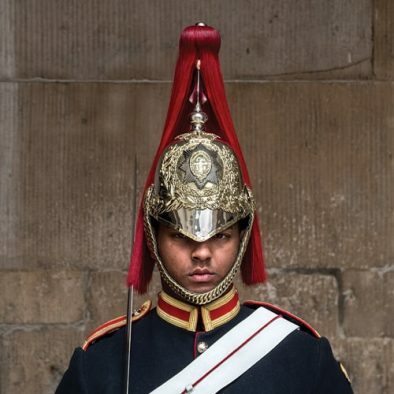 : £9pp (plus £5 entry to the museum). No booking required. No service charge. 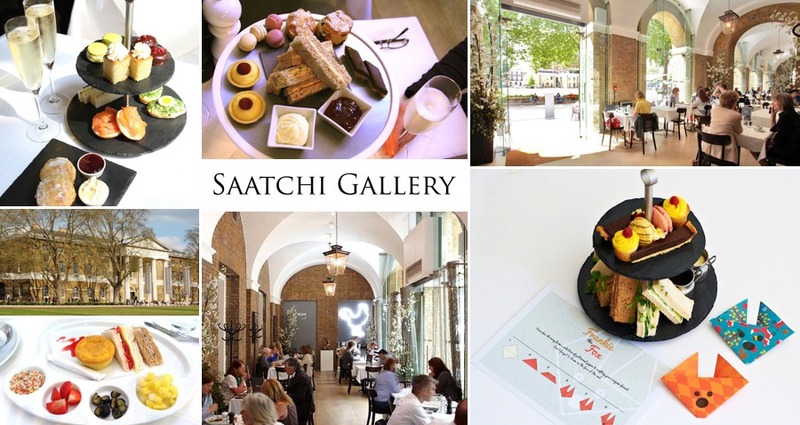 Located on the King’s Road, the free to enter Saatchi Gallery is a 70,000 square foot art space devoted to contemporary art. Afternoon tea is served in the Gallery Mess with its exposed brickwork, vaulted ceilings and display of art. There is an al fresco terrace which overlooks the green. A selection of British sandwiches are followed by scones with cream and jam, then pastries including a Financier, banana brownie, custard tart and macaroon washed down with a selection of Canton teas. A glass of champagne can be added for an extra £10 (£15 for two). Younger visitors can enjoy the Origamitea mini afternoon tea complete with sandwiches, babyccino and a cupcake to decorate with fresh and healthy ingredients. They can also pass the time with an origami kit. When? : 2.30 to 6pm daily. Book online. Cost? 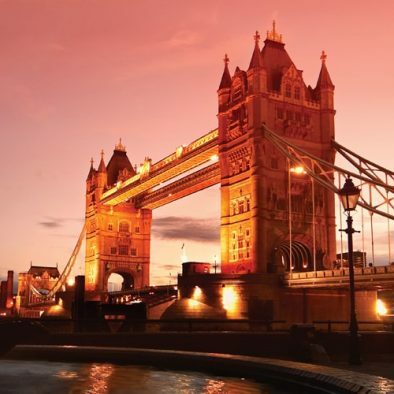 : £17.50pp (£34.50p for two) plus 12.5% service charge. Located in the heart of King’s Cross, the German Gymnasium was originally designed as the first purpose built gym in England (funded entirely by London’s German community) and was the venue for the first National Olympic Games in 1866. Served in the beautiful Grand Cafe, the afternoon tea combines original German food with traditional treats. There are two teas on offer. ‘The German’ starts with a sandwich and mini rolls of Black Forest ham, Obatzda (a Bavarian dish of soft cheese, butter and paprika seasoning) & gerkin, egg mayonnaise and shrimp with Marie Rose sauce. No scones here but a gooseberry meringue tart, Luebecker Nusstorte (a layered nut cake with sponge, cream, ground hazelnuts and marzipan) and “Rose Grutze” with vanilla sauce (a dessert of fresh red currants or berries). Tea or coffee is included and a glass of German sparkling wine can be added for £4.50. ‘The Austrian’ has savoury mini rolls of speck & celeriac remoulade, smoked salmon with cream cheese & rocket and cucumber and cream cheese. The sweet selection is a classic apple strudel with vanilla sauce, Sachertorte (a Viennese classic chocolate cake invented by Franz Sacher in 1832 – did you know December 5th is National Sachertorte Day in Austria?) and Viennese whirls, a soft butter biscuit invented by us Brits, popularised by Mr Kipling and inspired by Austrian pastries. When? : 3-5.30pm Thurs & Fri, 4-5.30pm Sat & Sun. Cost? : £18.50pp plus 12.5% service charge. Booking required. 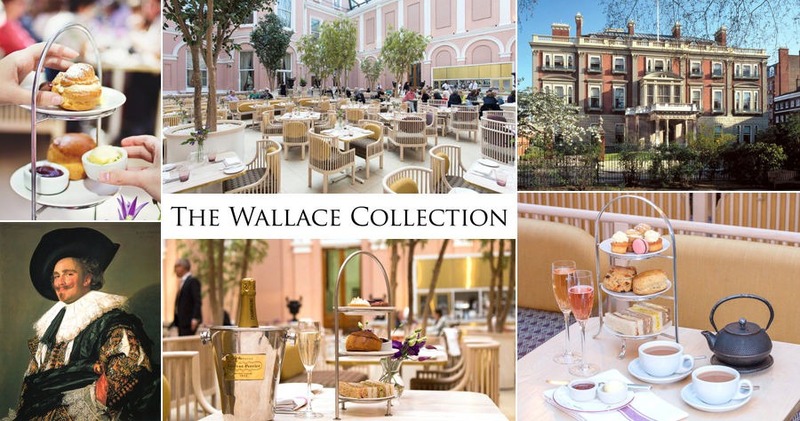 The Wallace Restaurant serves visitors to the Wallace Collection, an art gallery on Manchester Square and a short walk from Baker Street or Bond Street underground stations. The free to enter museum is home to works by Titian, Rembrandt, Van Dyck, Velazquez and perhaps it’s best known work, ‘The Laughing Cavalier’ by Fran Hals. The restaurant is operated by Peyton & Byrne and tea is served in an indulgent covered courtyard with plenty of natural light bathing the salmon pink walls of this double height atrium. The £18.75pp Wallace Afternoon Tea is served on a three tier stand. The finger sandwich selection includes cucumber with dill cream, egg, smoked salmon with cream cheese and coronation chicken. Scones with clotted cream and strawberry jam then follow. A selection of mini cakes and pastries finish the meal which may include lemon meringue pie, white chocolate cheesecake and a chocolate and raspberry heart. There are a good selection of black and green teas (from the lighter Earl Grey to the smoky Lapsang Souchong) plus herbal and fruit infusions. When? : Monday to Sunday 2.30 to 4.30pm. Booking required. If you’re planning a visit to one of the theatres in the Covent Garden area then the Crusting Pipe in the old Covent Garden Market is ideally placed. Located in the lower level of the piazza it is a wine bar with an outside seating area where you can enjoy the opera singers and classical musicians performing in the courtyard. You can also sit inside in the alcoves and cellars. Just so you know, a Crusting Pipe is the barrel used for making crusted port containing 570 litres. Your tea starts with finger sandwiches. Fillings include ham with mustard mayonnaise, egg mayonnaise, cheddar & chutney and smoked salmon with cream cheese. Freshly baked scones with cream and jam follow and you finish with pastries including Battenberg and cameral éclairs all washed down with a selection of Fairtrade and organic clipper teas. A flute of Davy’s champagne can also be added (£25.95pp). As an alternative to the Traditional Afternoon Tea, Crusting Pipe have introduced a special menu which allows you to enjoy a selection of British cheeses accompanied by oat biscuits, chutney, fig cake and a dock of Davy’s Finest Reserve Port. Cost? : £18.95pp (£22.95pp for the cheese and port afternoon tea) plus 10% service charge. Booking required. The Tea Terrace operates from two branches of House of Fraser in Central London; one on the fifth floor of the Oxford Street branch and the other on the second floor of the Victoria Street branch. Stepping into the Tea Terrace is a bit like stepping into the pages of Alice in Wonderland. The decor is quasi-modern with Victorian regal throne chairs and ornate sofas and a colour theme of white and pastel pinks and blues. The tea theme is everywhere with quotes about tea on the walls, chandeliers made of teapots, teacups and teaspoons. Traditional afternoon tea is served on Royal Albert fine bone china on a three tier cake stand. The bottom tier has sandwiches with a choice from up to six flavours – egg mayonnaise, cheese & chutney, smoked salmon & cream cheese, ham & tomato, cucumber & cream cheese or tuna mayonnaise. The scones are the real star with a wider selection than those normally on offer. Choose two from plain, fruit, cranberry & white chocolate, or ginger, all served with clotted cream and jam. If you prefer savoury there are cheddar cheese & herb scones. To finish comes three square slices of traditional English cakes plus French petits fours. The tea selection is extensive and includes Tregothnan English herbal teas from Cornwall including infusions of nettles, Manuka honey, Echinacea and Lemon Verbena. Variations on the Traditional Afternoon Tea are the “Indulgence” which comes with four mini Belgian chocolate desserts (£24.95) and the “Celebration” with a glass of Prosecco (£27.75). There is also a gluten-free alternative (£25.75). Transport ? : Oxford Street – between Bond Street and Oxford Circus tube stations. Victoria Street – between Victoria and St James’s park tube stations. When? : Daily from 12 noon. Cost? : Traditional afternoon tea is £22.75 for one, £44.95 for two. No booking required. No service charge. 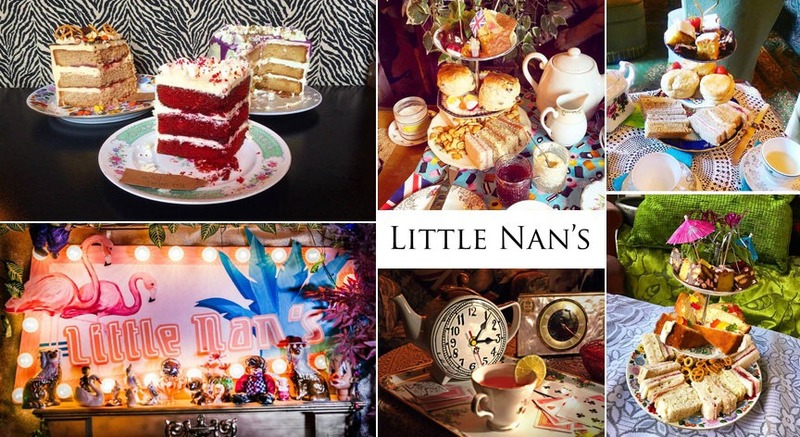 For a quirky afternoon tea head south out of town to experience Little Nan’s Bar. In 2013 it first opened in the backroom of a nightclub off Deptford High Street serving teapot cocktails. In 2014 Little Nan’s Afternoon Teas started and proved to be a great hit. The Deptford Bar now occupies three arches close to Deptford train station and a second home was opened in 2017 at Catford Broadway Theatre. Afternoon tea comes on a three tier stand with vintage china. Finger sandwiches of smoked salmon & cream cheese, egg mayo, ham & mustard plus a seasonal flavour and veggie filling. Followed by (you’ve guessed it) scones with cream and jam and finally Victoria Sponge, a selection of mini pastries & cakes and a seasonal treat. Tea (of course) and for an extra £3 a boozy teapot cocktail. Cost? : £25pp. Booking required. The original Bea’s cafe opened in February 2008 in Bloomsbury selling cakes, pastries and sweet & savoury treats for the local area. Since then the St Paul’s cafe, overlooking the Cathedral opened and the Marylebone branch, a short distance from Madame Tassauds and Regent’s Park complete the trio of Bea’s cafes offering afternoon tea (I would go for the Bloomsbury branch and try to get a table near the front). The full afternoon tea starts with a selection of savoury mini brioche buns with avocado & a Dukkha spiced yoghurt, Parma ham with mascarpone cream, honey & fig relish, egg mayonnaise and smoked salmon with crème facile. Scones with clotted cream and jam are followed by a choice of individual patisseries. These vary but may include a cupcake, mini meringues, macaroons, chocolate fudge, lemon meringue, marshmallows and a selection of brownies. There is also the option to have a glass of champagne (£34.50pp) or prosecco (£32.50pp). A wheat free and vegetarian afternoon tea is also available by prior request. Transport ? : St Paul’s : St Paul’s tube station. Bloomsbury : Holborn tube station. Marylebone : Baker Street, Regent’s Park or Bond Street tube stations. When? : Varies by location but core hours 11am to 4pm. 1.5 hour slot or 2 hours for a group of 6 or more. St Paul’s has upstairs seating and there is no lift. Cost? : £26.50pp plus 12.5% service charge. Booking required. 50% advanced payment required on booking. Nothing to do with the Reform Club in Pall Mall, The Reform Social & Grill gives the air of a gentlemen’s dining club with its button back leather sofas, marble topped tables, large station waiting-room clock and menus printed in handbill typefaces. The Great British Afternoon Tea is inspired by the 1940s and 50s with classic finger sandwiches made up of the usual suspects – cucumber & cheese, coronation chicken, tuna & sweetcorn, smoked salmon & cream cheese and egg mayonnaise and followed by the scones with clotted cream and jam. The sweet bites don’t particularly smack of Britishness. Sacher cake (Austrian), Rhubarb & Custard macaron, Strawberry fraisier cake, apple tart (all French), coffee & chocolate torte (from the Italian Torta) and a Victoria sponge cake (yipee British). There is a good selection of teas or for £39pp you can have free flowing bubbles (limited to 1.5 hours). If you would rather swap the sandwiches for something more substantial the Gentleman’s Afternoon Tea includes a Welsh rarebit finger (spicy melted cheese on toast), mini smoked salmon bagel, roast beef in a Yorkshire pudding and crispy haddock fish finger with tartar sauce. Children haven’t been left out as the Reform offers a Mini Afternoon Tea (£12.50) with a peanut butter and jam sandwich, fish finger and ketchup sandwich and a BBQ chicken slider. The sweet bites follow with a fruit and chocolate chip scone washed down with a strawberry milkshake with gingerbread man dipper. Finally there’s a chocolate and marsh mellow lollipop, jelly and custard and a jammy dodger (two shortbread biscuits with a jam filling). Cost? : £26.50pp plus 12.5% service charge. Booking required. Located a stone’s throw from Covent Garden market and the Royal Opera House, Balthazar is ideally located from London’s theatre district. New for 2018 is their collaboration with online flower delivery service FLOWERBX to create a selection of cakes that represent the season’s flowers developed by Balthazar’s head pastry chef Regis Beauregard. With a choice of herbal teas and infusions, the tea starts with a selection of sandwiches including cucumber, mint & hummus, smoked salmon & lemon crème fraiche, egg mayonnaise, coronation chicken with apricot and a lobster prawn roll. Scones follow and then the FLOWERBX inspired cakes arrive. Each of the five cakes are in the shape of a bloom and paired with flavours to complement the flower and its hue. These include a “Tulip” of Apple and Blackberry, a “Hydrangea” of coconut and Yuzu, a salted caramel “Anemone”, a lemon and blueberry “Dahlia” and a Balthazar raspberry “Rose”. As an addition to the tea selection the FLOWERBX fizz cocktail has been created combining pinky vodka, violet petals and other flavourings (£39.95pp). When? : 3 to 5.30pm Mon-Fri, 3-5pm Sat, 3-6.30pm Sun. Cost? : £29.95pp plus 12.5% service charge. Booking required. 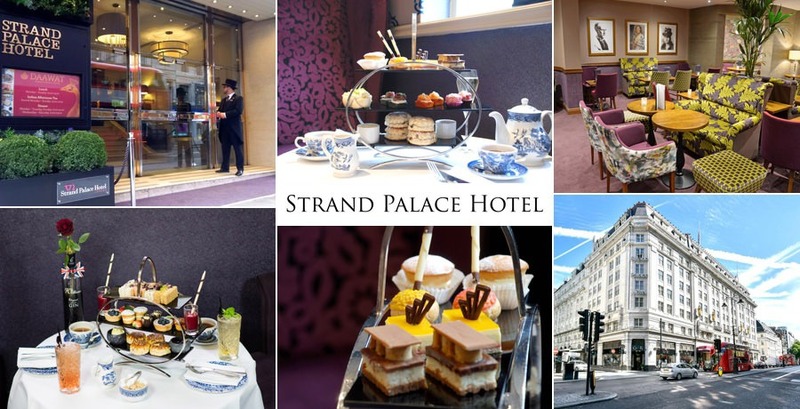 The Strand Palace Hotel sits close to the north end of Waterloo bridge just opposite the Savoy Hotel and offers a traditional afternoon tea for those on a budget, for less than half the cost of its up market neighbour. Served in the Lounge Bar, The Covent Garden Afternoon Tea starts with a selection of finger sandwiches served in interesting breads. Egg & cress on white bread, prawns & lime in a beetroot panier, smoked salmon & cream cheese on charcoal bread and Sirloin steak with horseradish on orange bread. Scones with clotted cream and jam are next and a selection of cakes follow including a classic Victoria sponge, chocolate choux, passion fruit mousse and a chocolate & caramel ganache accompanied by a selection of loose leaf and herbal teas. A glass of prosecco (£6) or champagne (£9) can be added. As an variation to the traditional afternoon tea (and at the same price) the Strand Palace also offer the “G & Tea” where the “G” is a gin-infused tea cocktail. The sandwiches include cucumber & cream cheese, egg mayonnaise, chicken with preserved lemon and beetroot gravlax with juniper or rye bread. Scones and then a Bakewell tart, raspberry and juniper-infused shot, Victoria sponge, blueberry and lemon tart and a chocolate cup filled with vanilla and mocha mousse follow. Five gin cocktails are on offer including an apple crunch tea with Williams Chase gin and vanilla syrup, Earl Grey tea with Hoxton gin and coconut and a Persian pomegranate tea with Brockmans gin and wild berries. Transport ? : Covent Garden, Temple or Charing Cross tube stations. 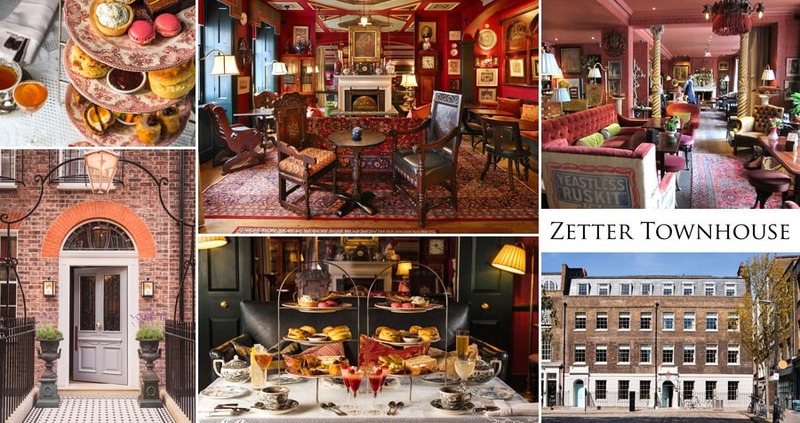 The Zetter townhouses are a pair of Georgian boutique hotels oozing with quirky character, the decor inspired by the collection of Sir John Soane with mismatched antique furniture and red toned walls decorated with an array of frames and curiosities. In Marylebone tea is served in Zetter’s Uncle Seymour’s Parlour whilst the Clerkenwell property, owned by their Great Aunt Wilhelmina, it is served in the Cocktail Lounge. You can choose from two afternoon tea menus. Aunt Wilhelmina’s has the more traditional finger sandwiches of honey roast ham, chicken Ceasar, smoked salmon and egg mayonnaise. For a more heartier start choose Uncle Seymour’s menu with a pasty, devilled egg, truffled sausage roll with brown sauce and a mini Croque Monsieur. Scones with clotted cream and jam follow and you finish with a selection of cakes including a red velvet slice, Greek yoghurt & acacia honey mousse and a vanilla choux. There are, of course, a wide selection of teas or you can enjoy a tea infused cocktail. There is also the option of a vegetarian afternoon tea, just let them know when you book. Cost? : £33pp plus 12.5% service charge. With cocktail £40.50 or bubbles, from £43.